Now that our signature Bank of America Winter Village Holiday Shops events (Tasting Tuesday, Walk the Shops, and Get On the Map!) are over for the season, we have one final way to win a Holiday Shops gift certificate! The recent cold weather has increased the chances that the Josephine Shaw Lowell Fountain will freeze. 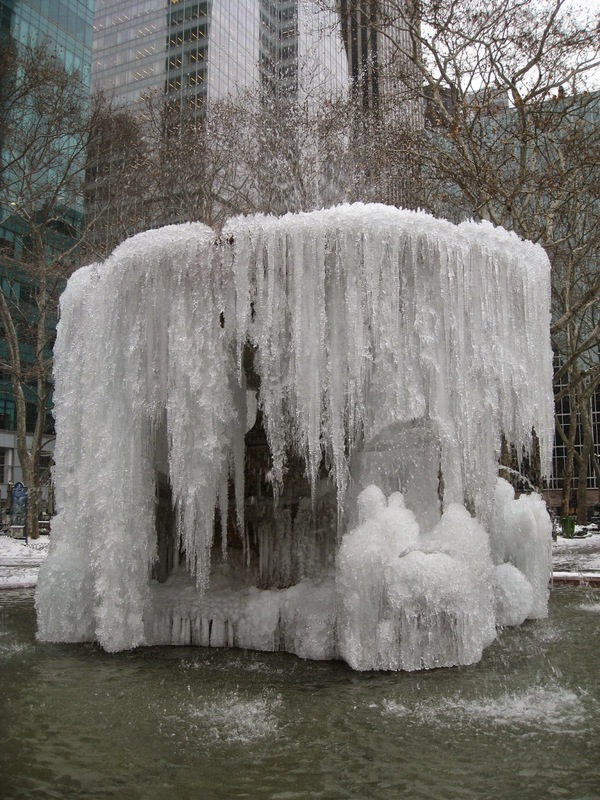 We love the public's excitement when the fountain freezes, past years have seen some truly stunning frozen fountains. This year, the fountain freeze can win you a gift certificate to the Holiday Shops. The Fountain has frozen over spectacularly in previous years. Just an icicle or two won't qualify as "frozen" for us! 1) Foretell the Freeze - predict the date on which the Fountain will freeze. Tweet your guess with the hashtag #BPFrozenFountain; the person with the closest guess will win a Holiday Shops Gift Certificate. 2) Freeze Frame - after the Fountain has frozen, Instagram your most artistic photo of the icy Fountain with the hashtag #BPFrozenFountain; the person with the best photograph of the Fountain will win a Holiday Shops Gift Certificate. The Frozen Fountain contest sign is placed near the Fountain, so remember to play! If the Fountain does not freeze sufficiently (we'll be the judge, and an icicle or two just isn't going to cut it) before the Holiday Shops close for the season on January 4, the game will be paused until next winter! Why doesn't the fountain sustain crack damage due to expanding ice?